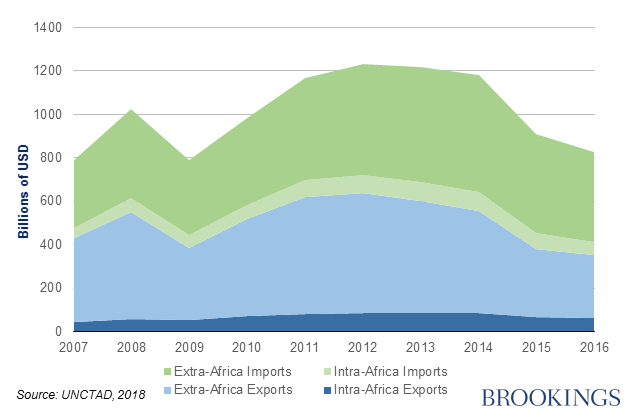 Every week, the Africa Growth Initiative, at Brookings posts “Figure of the week,” a short blog post that explains recent developments on the continent. The post highlights an interesting chart, table, or graph from recently published reports that explore important statistics or policy developments. This week, in our last “Figure of the week” for 2018, we revisit the top five most read posts of the year. In March, African countries signed the Continental Free Trade Agreement (AfCFTA), which created the largest free trade zone since the creation of the World Trade Organization in 1995. The AfCFTA commits countries to cut tariffs on 90 percent of goods. 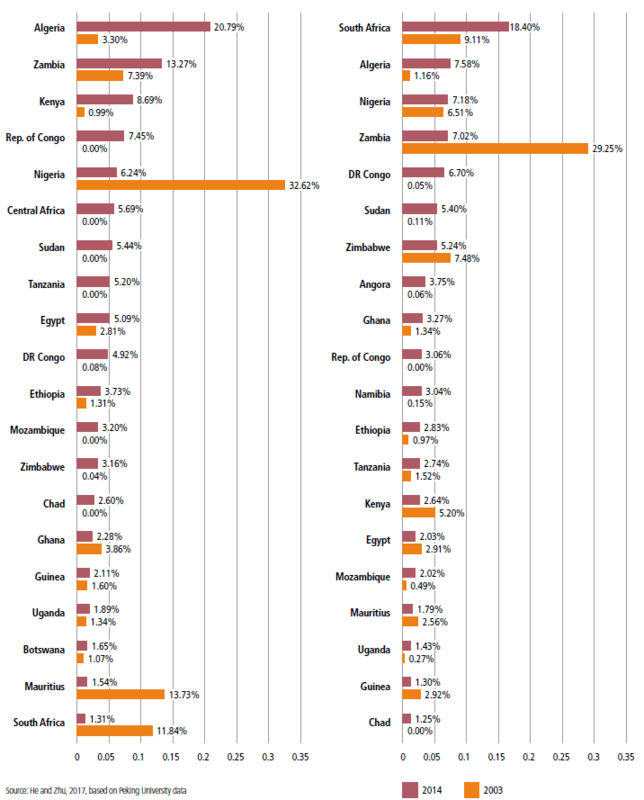 As the figure below shows, intra-African trade makes up a small portion of the region’s total trade. At 18 percent of exports, Africa lags well behind Asia and Europe where intra-regional exports comprise 59 and 69 percent of exports respectively. Increasing intra-African trade a central goal of the agreement. Earlier this year, U.N. Habitat released the 2018 edition of its “State of African Cities” report focusing on investment in Africa. One section of the report focuses on China’s growing engagement on the continent. 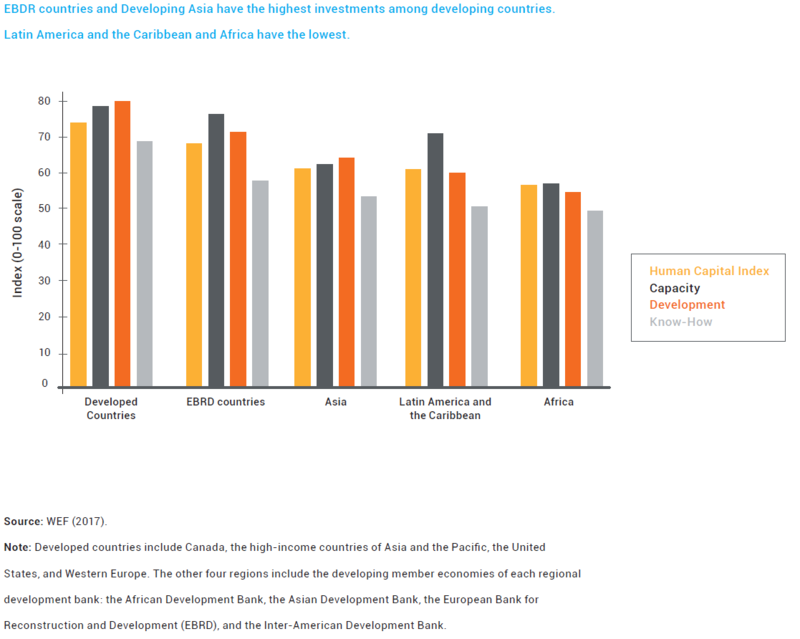 The figure below shows the increasing dispersion of foreign direct investment (FDI) into Africa. In 2014, a lower share of Chinese FDI flows were directed to established investment markets like Mauritius, Nigeria, and South Africa. However, 50 percent of China’s FDI stock was located in only six countries, with five of them being resource-rich nations. Source: U.N. Habitat. 2018. The State of African Cities 2018 – the geography of African investment. In June, United Nations Conference on Trade and Development released its annual Economic Development in Africa report. The theme for this year’s report was “Migration and Structural Transformation,” which documents intra-African migration trends and the economic impact of migrants in host countries. The figure below shows the top 15 intra-African migration corridors in 2017 by migrants stocks. 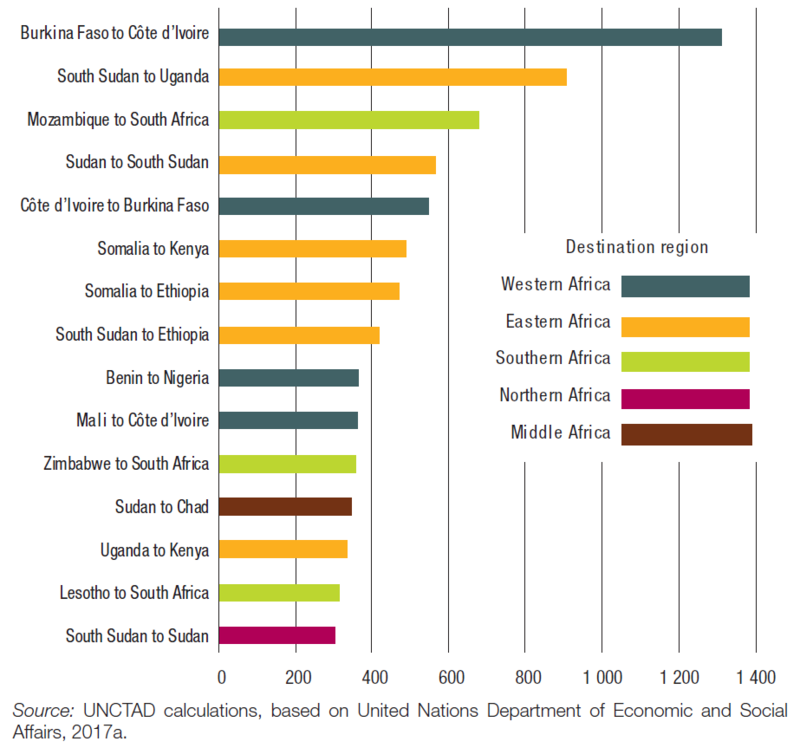 The report finds that migration corridors in West and Southern Africa are mostly economically driven as they connect migrants to jobs in farming and informal trade. Source: UNCTAD. Economic Development in Africa Report 2018: Migration for Structural Transformation. A report released by four regional development banks this summer, The Future of Work: Regional Perspectives, assesses the impact of rapid technological change on countries globally. In the section on Africa, the report finds that new technologies could create jobs by stimulating new types of economic activity, but rising productivity could also lead to fewer people being needed to perform the same tasks, causing challenges in job creation. With Africa’s youth population growing rapidly over the next few decades and expected to double by 2050, the impact of technological advancements on employment is an increasingly pressing issue. The report emphasizes the need to prepare workers for new sectors and train them in science, technology, engineering, and mathematics education, which currently lag behind in the region as the figure below shows. 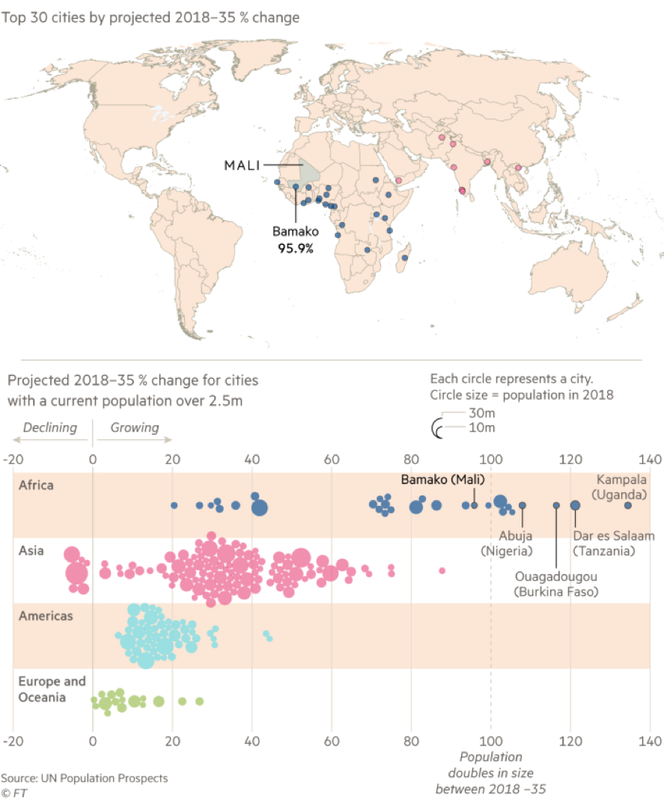 The 2018 revision of the World Urbanization Prospects finds that 10 of the world’s fastest growing cities between 2018 and 2035 will be in Africa. Africa’s urban population is growing rapidly as overall population increases and people continue to move from rural to urban areas. The figure below shows, eight African cities are expected to more than double in size between now and 2035. Also interestingly, many of the fastest growing African cities such as Lagos, Abuja, Abidjan, and Kumasi are located in the Gulf of Guinea.